The Rajasthan Royals are all set to take on the Kings XI Punjab in the fourth game of the Indian Premier League at the Sawai Mansingh Stadium in Jaipur. Now, the news from the centre is that the Rajasthan Royals have won the toss and have opted to bowl first. Both teams have sweated it out immensely in the nets ahead of the exciting game. You can follow the live score updates here. Both teams have locked horns with each other on 17 occasions out of which the home team has won 10 games. The remaining matches were won by the Kings XI Punjab. The Rajasthan Royals have remained unbeaten in the last five home games that they played against Kings XI Punjab. Both teams will rely heavily on their openers- KL Rahul from KXIP and Jos Buttler from Rajasthan Royals. Check out the video of the toss below. Both KL and Buttler had scored runs for the team when the two teams clashed with each other in the IPL 2018. Both teams had won their respective ties at home. 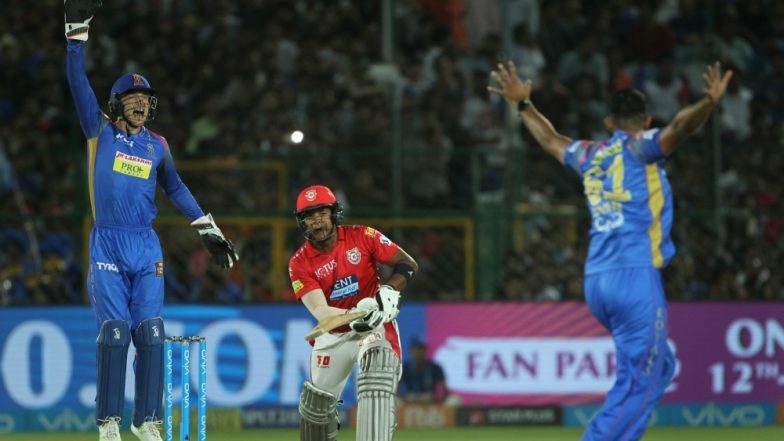 RR vs KXIP, IPL 2019, Jaipur Weather & Pitch Report: Here's How the Weather Will Behave for Indian Premier League 12's Match Between Rajasthan Royals and Kings XI Punjab.